In the early morning when the temperature is still pleasant I walk the tared ring road southward at the foot of mount Ziban, In Keren Lalay I pass a new Catholic school under construction and other modern mixtures of building styles.Walking through Keren I pass a variety of housing styles: traditional Bilen mud plastered huts with their typical cone shaped roofs, square stone or concrete white painted houses decorated with mosaic or dressed with bougainvillea, and Italian style villas built by the Italian colonisers. Minarets, Catholic domes and bell towers, Orthodox churches and even an Evangelical church. Back in the center I walk into a local bicycle race. 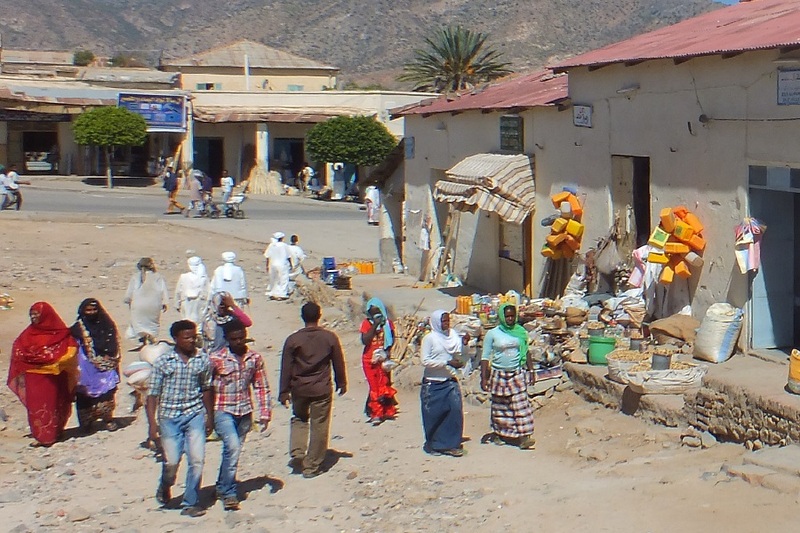 Cycling is popular in Eritrea. The smooth tared rads connecting the major Eritrean towns provide a perfect training track for the Eritrean sportsmen (and women). The public offers me a chair for a confortable view on the local event through the main streets of Keren, that lasts for an hour. When it is finished I resume my walk to visit the hill that carries a huge candle in rememberance of the many tens of thousands of Eritrean Martyrs and other victims who gave their lives fighting for (1961-1991) and then defending (199-2000) the liberation of Eritrea from crual conditions of Ethiopian rule (1952-1991). 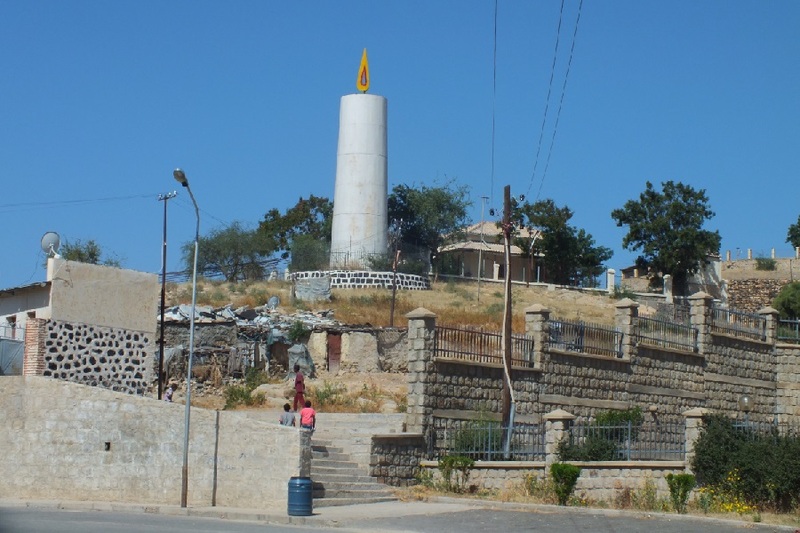 In 1970 the nearby village of Ona was the scene of a massacre by the Ethiopian army, during which the 750 villagers were all stabbed or burnt in their huts. The temperature rises and therefore I stay close to the center where one will find attractive cafe's and restaurants. My favorite is the pleasant outdoor area shaded by trees in front of the Red Sea Hotel overlooking Giro Fiori. From the tarace I watch present and past: Modern Chinese King Long buses and recent Indian TATA buses compete with Italian old-timers landcruisers, bicycles, camels, horse carts and donkeys. It is here in Keren where Muslim blends with Christian culture, meeting in perfect harmony, setting an example to the world. Children pass the tables on the terrace selling peanuts or roasted chickpeas to the visitors of this open air bar. I watch the activity in the market area and chat with the men selling various fruits grown in the nearby Elabered agricultural estates and Agorgat banana plantations. No problem to make some pictures after the chat. Before I leave I buy some fruit. Plenty of vitamine C for lunch. I receive a free banana as a bonus. At the clothing market I watch the tailors sewing Muslim style white djelabea (dresses) and sirwan (trousers) for the men and black veils for the women, and brightly coloured traditional dresses for the Christian women. The low roofs overhanging the varanda's in front of the workshops are used to exhibit the textile products, creating a colorful scenery. After a small lunch with Hansu and Afworki I choose the other side of town for a walk. Following the dry Shifshifit river bed I climb the former railway bridge to follow the imaginary railway track in the Asmara direction to Geza Woreqet. It is not always clear where the train used to go because the rails disappeared and the track itself detoriated, so I keep asking meself the question "where would I go if I were the train?" It is the less gradient wider route through the Keren outskirts. Loud music attracts my attention to one of the traditional houses. "Come in!" I am told that they celebrate the baptism of a baby boy. 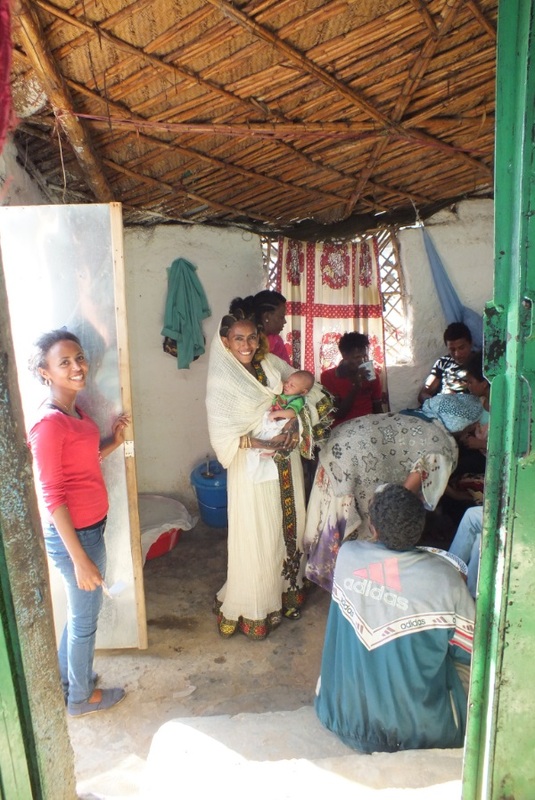 In Eritrea the son will be baptized after 40 days and a girl after 80 days. 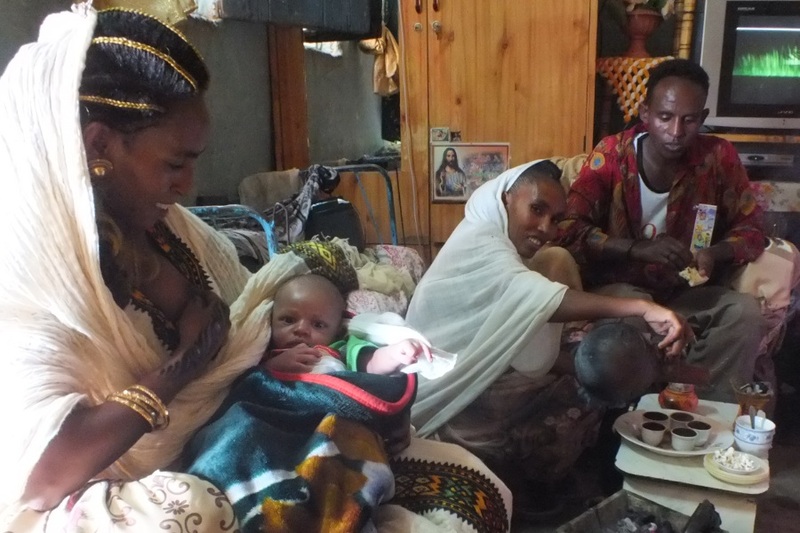 Today is the baptism ceremony of Mehretab, son of (father) Eyob and (mother) Oqba. The occasion is celebrated with the family, friends and neighbors. Visitors come in with Araki and other gifts. I feel ashamed I came empty handed. I am extremely touched when the mother asks me to hold the baby so the photographer and video operator can add me to the photo and video reportage of this joyfull event. Very careful I support the baby's head and neck and pose for the camera's with the baby boy. I join the coffee ceremony and make some pictures. When I leave the house the parents show their gratitude for my visit. Again I am touched. I should show them my gratitude for their hospitality. I hope I will be able to find their house when visiting Keren again in 2016 (the railway track will be my guide). And I should not forget to bring something for the baby then. 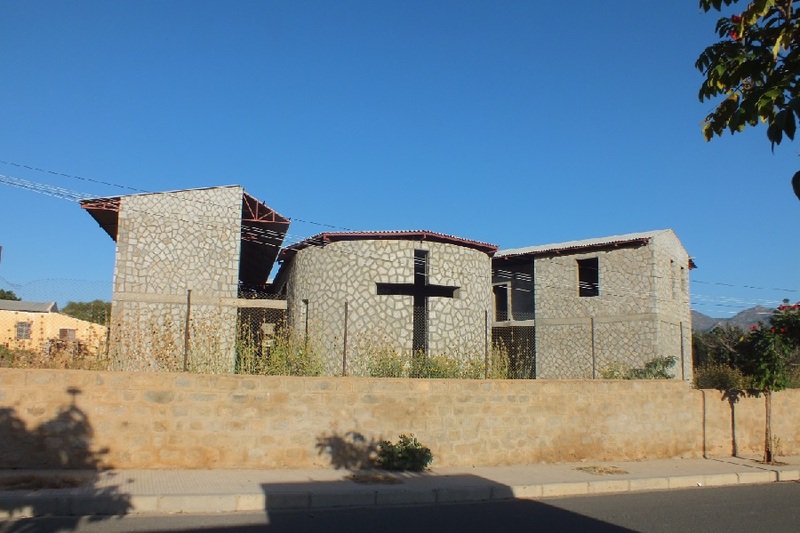 New catholic school under construction - Keren Eritrea. 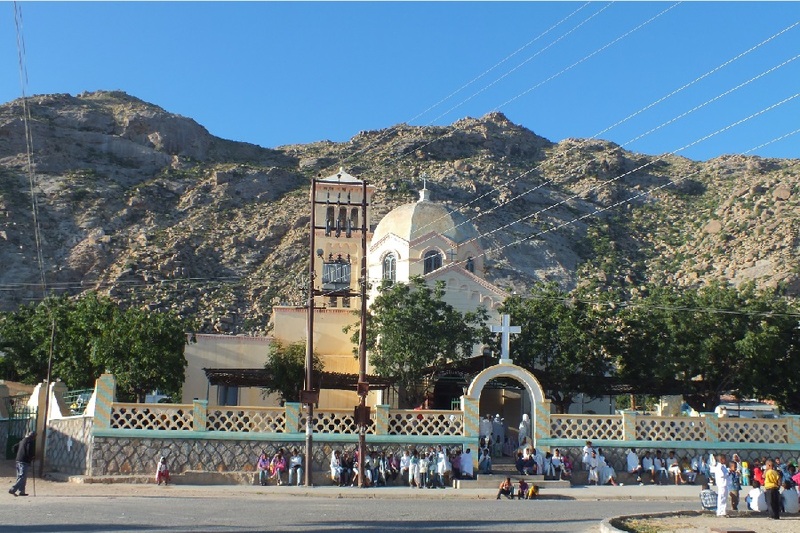 Kiddus Michael Catholic Church - Keren Lalay Eritrea. 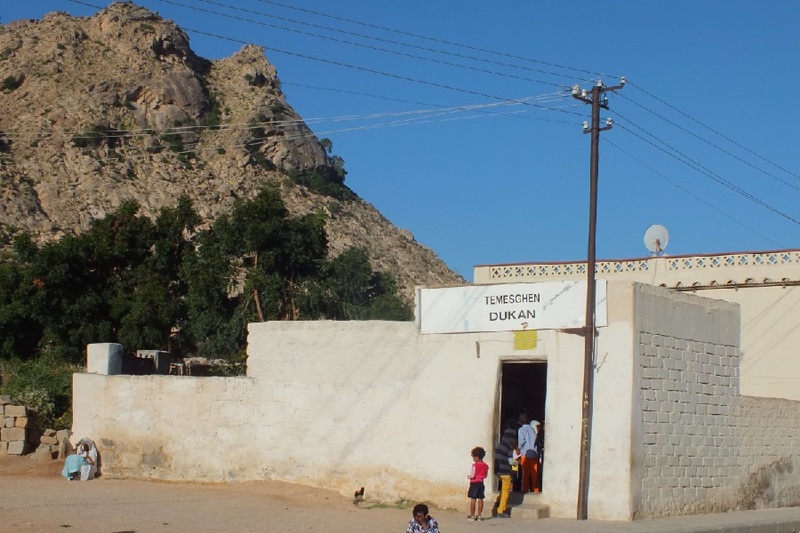 Temeshen Dukan (grocery shop) - Keren Lalay Eritrea. 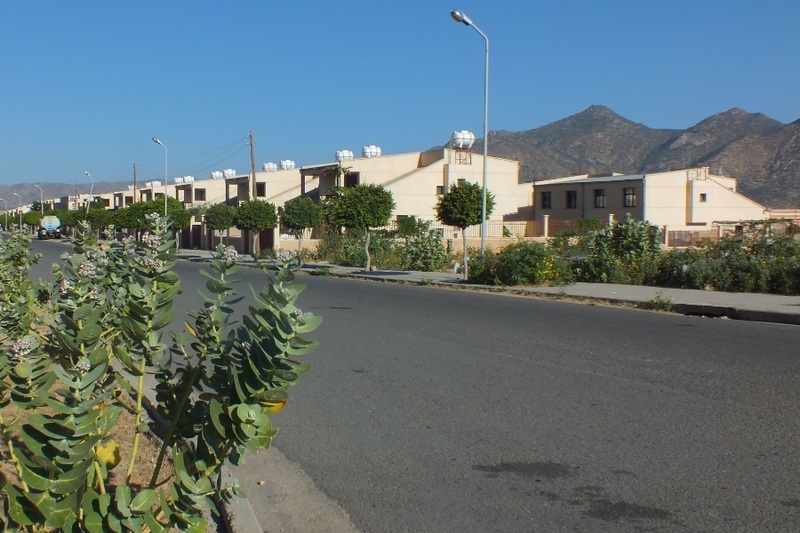 New built residentional area - Nda Bila Keren Eritrea. 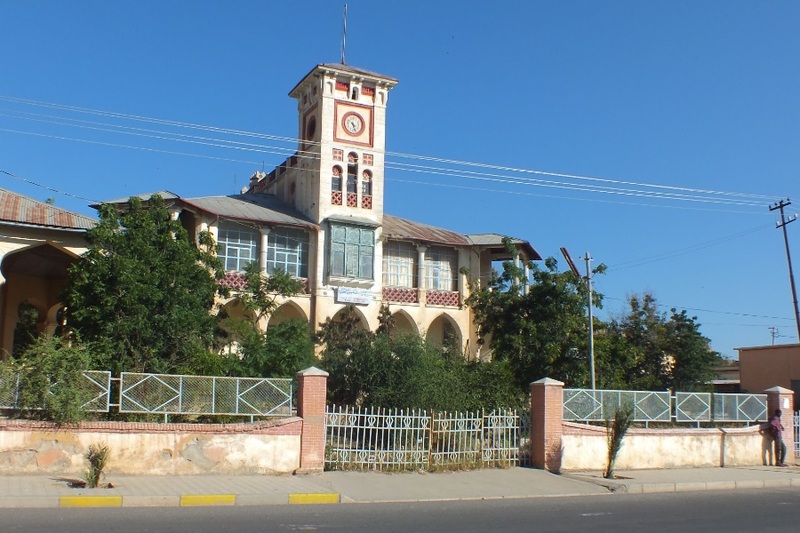 Administration of Keren - Keren Eritrea. 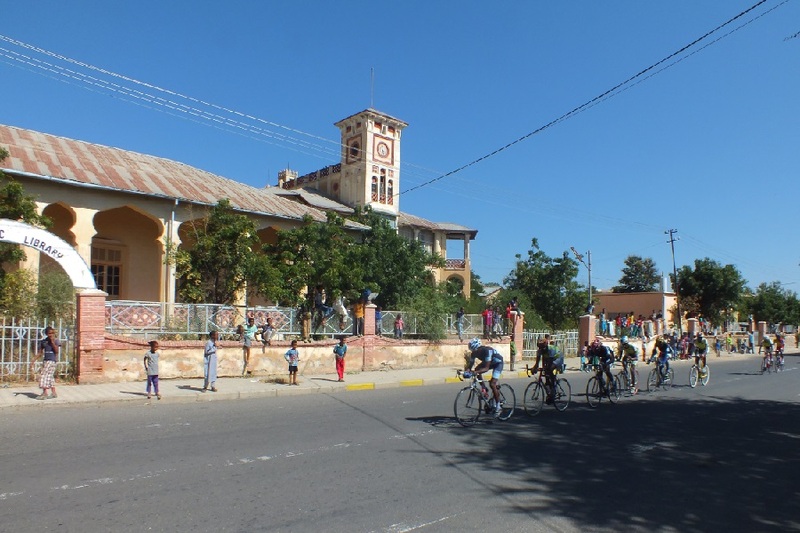 Bicycle race / Public library - Maeckelav Ketema Keren Eritrea. Memorial candle for Eritrea's Martyrs - Keren Eritrea. 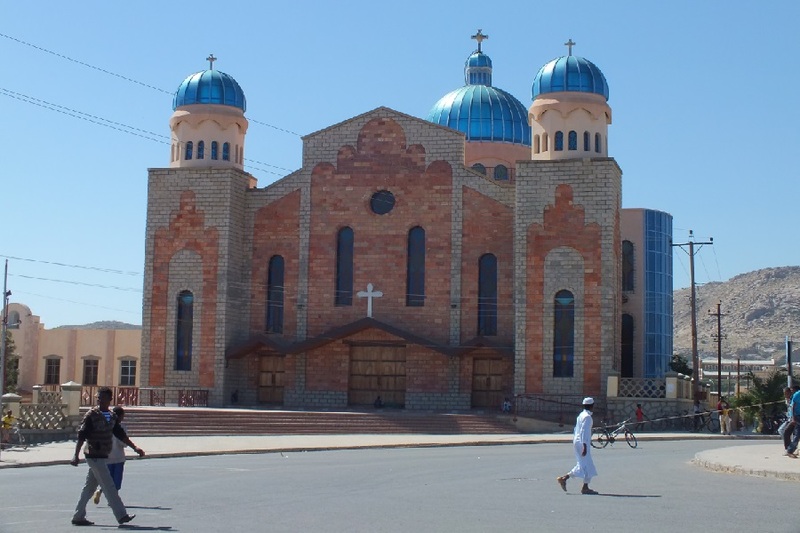 Anseba Region Catholic Cathedral - Center of Keren Eritrea. 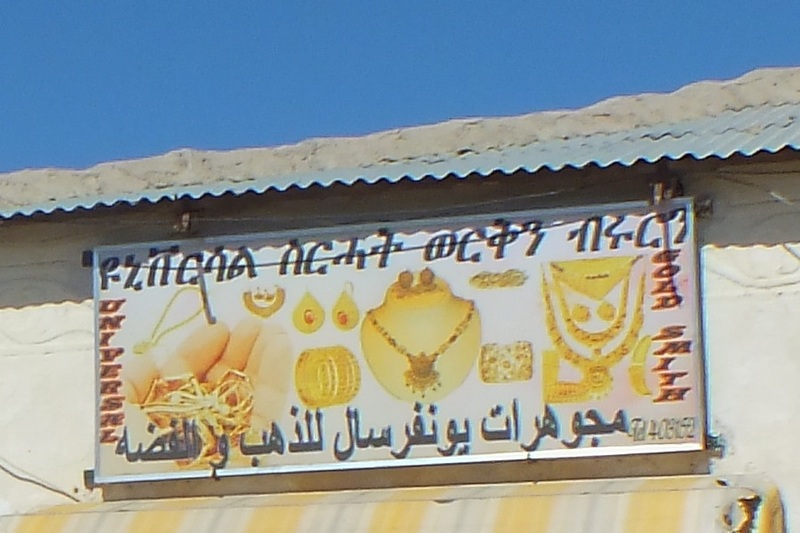 Universal Gold Smith - Center of Keren Eritrea. 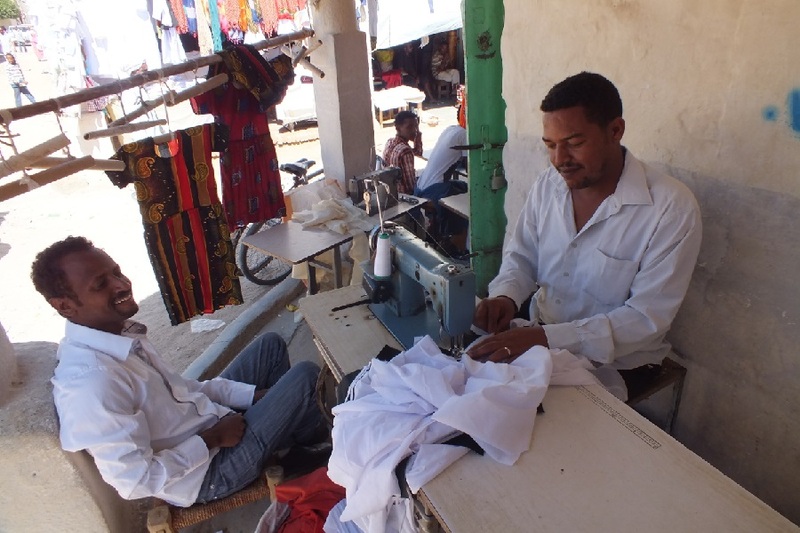 Tailors workshops - Souk Keren Eritrea. Tailors workshop - Souk Keren Eritrea. 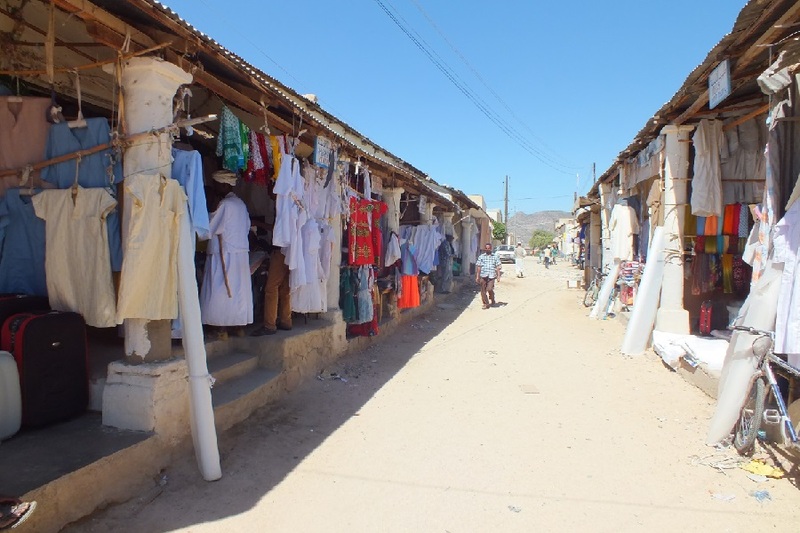 Shops and workshops - Center of Keren Eritrea. 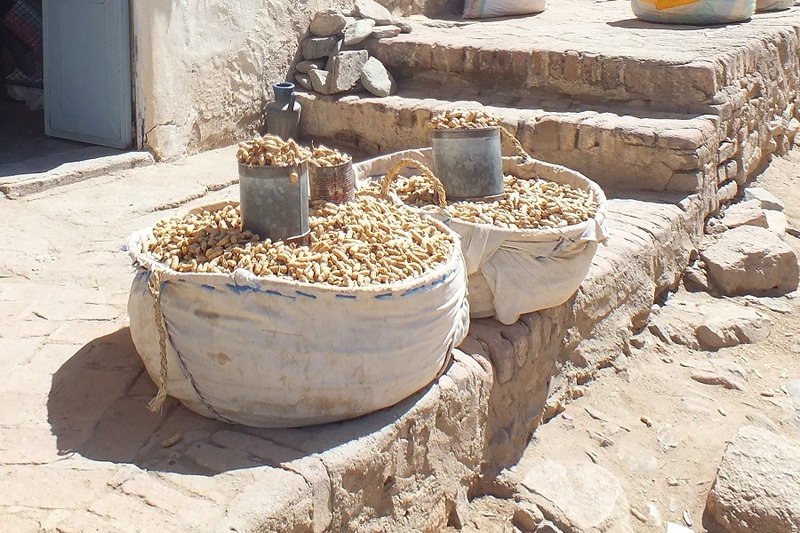 Peanut wholesale - Center of Keren Eritrea. 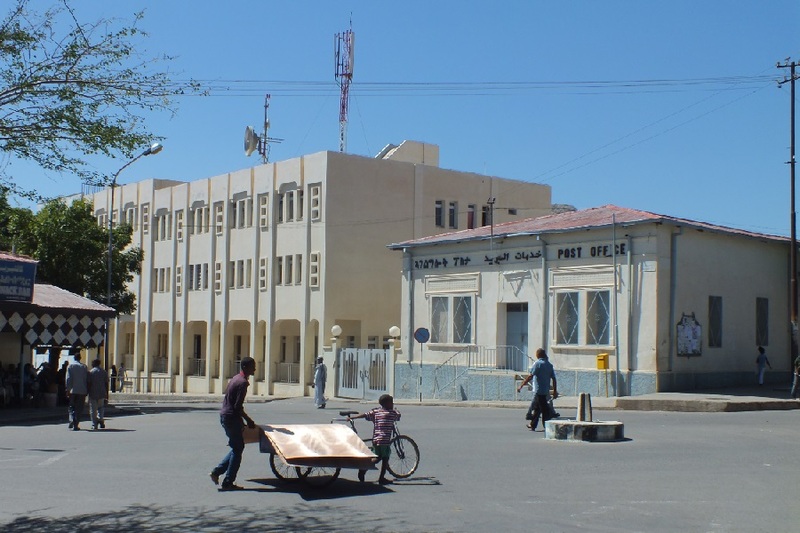 Telecommunications and post office - Center of Keren Eritrea. 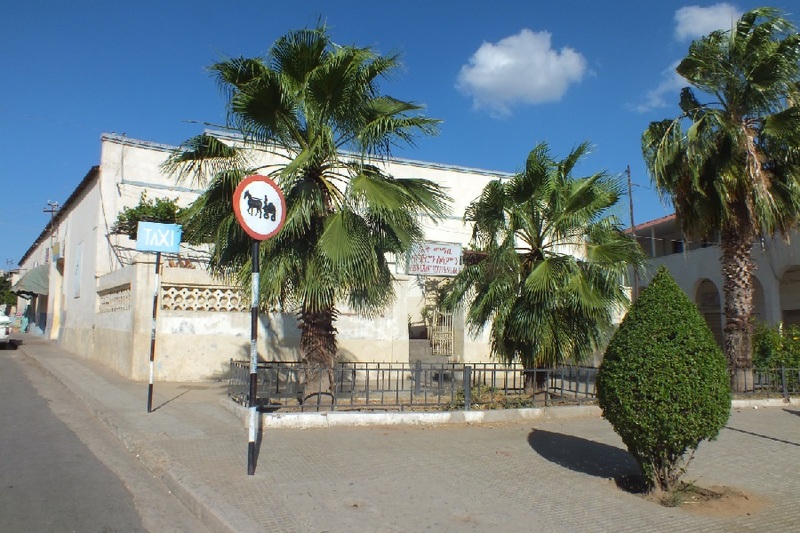 Restaurant Fickri and Selam - Giro Fiori Keren Eritrea. 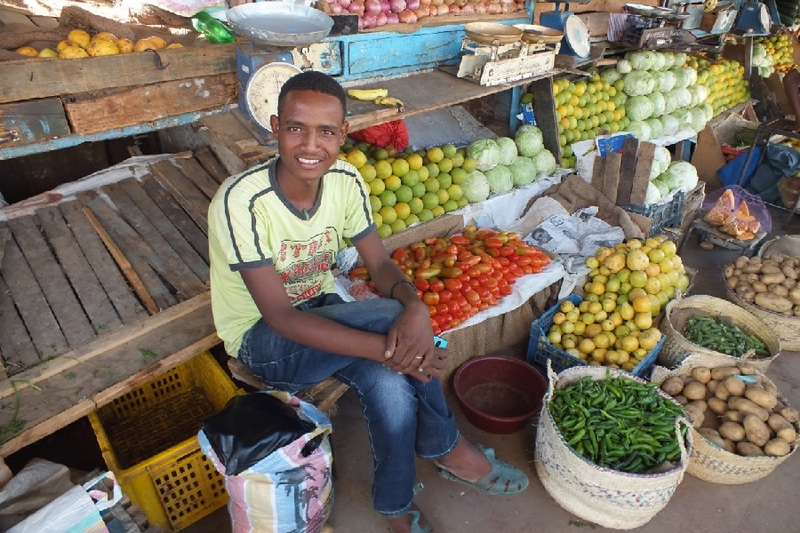 Vegetable and fruit market - Souk Keren Eritrea. 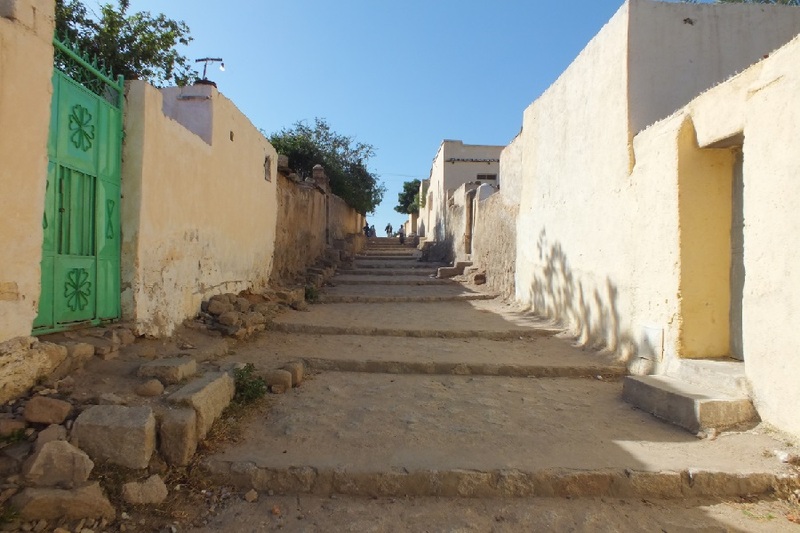 Leveled uphill alley - Keren Eritrea. 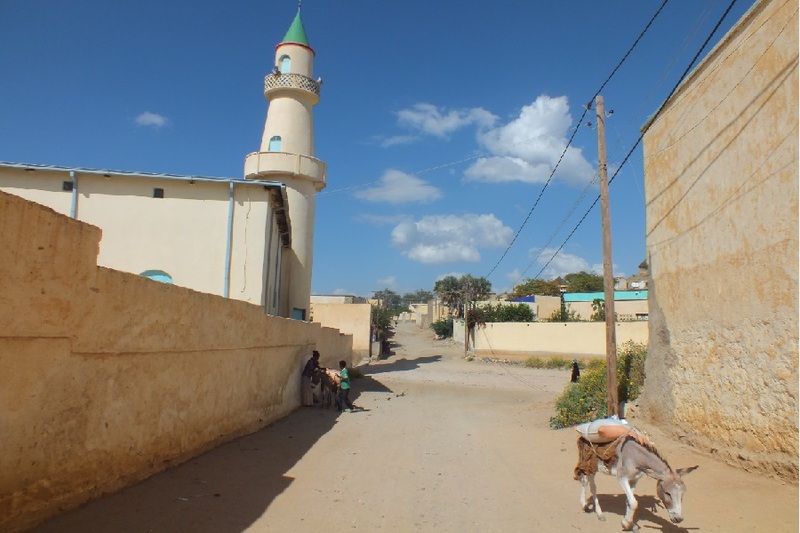 Green topped minaret and mosque - Keren Eritrea. 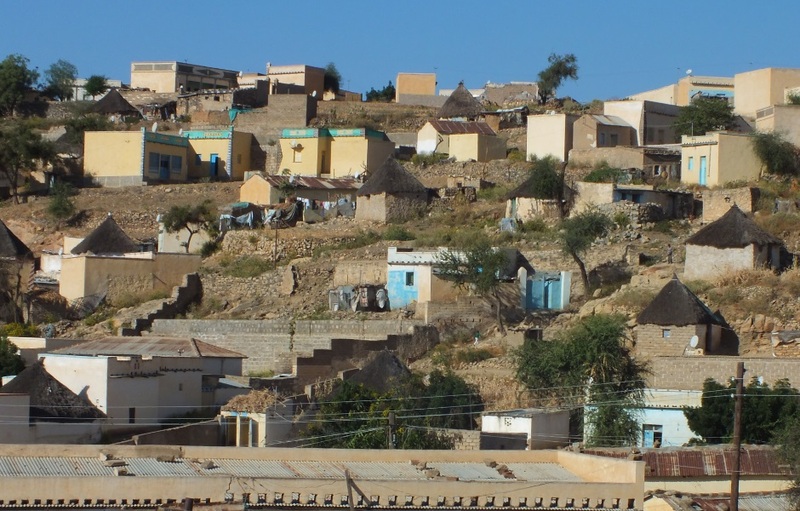 Traditional houses (Agudo's or Tukuls) - Keren Eritrea. Mehretab son of (father) Eyob and (mother) Oqba. Baptism of Mehretab - Keren Eritrea. 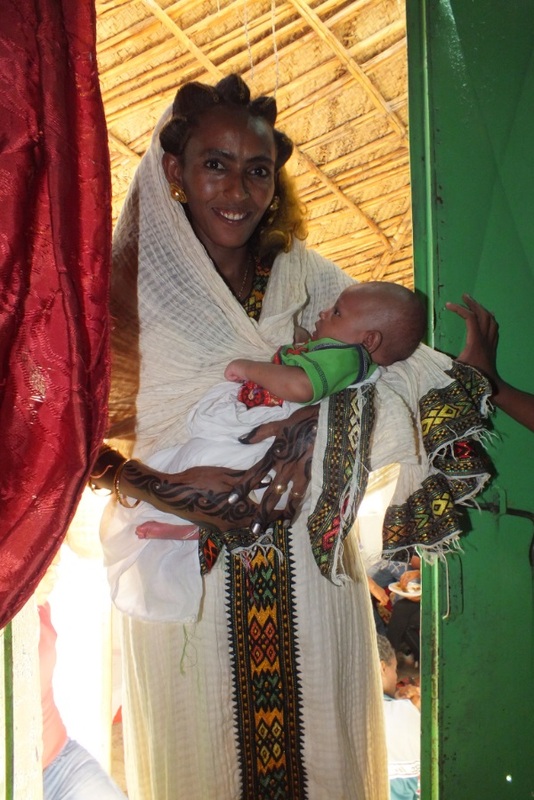 Oqba and baby Mehretab - Keren Eritrea. 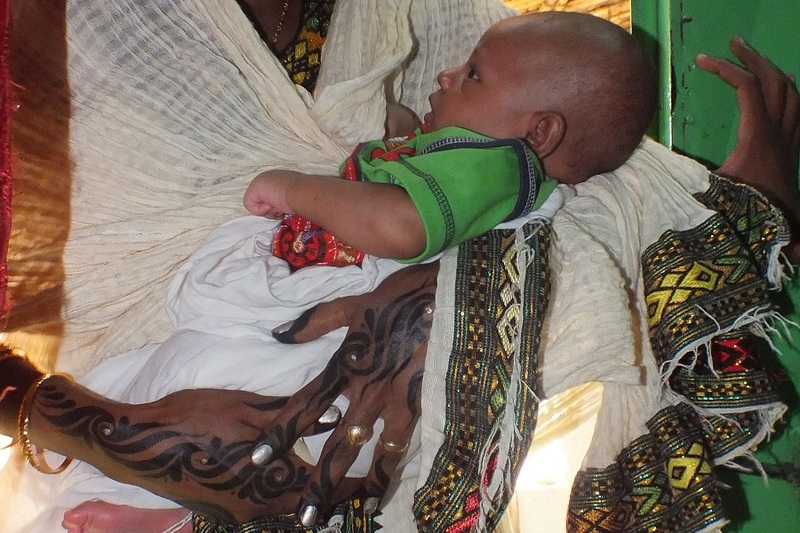 Baby Mehretab (40 days) babtism ceremony - Keren Eritrea. 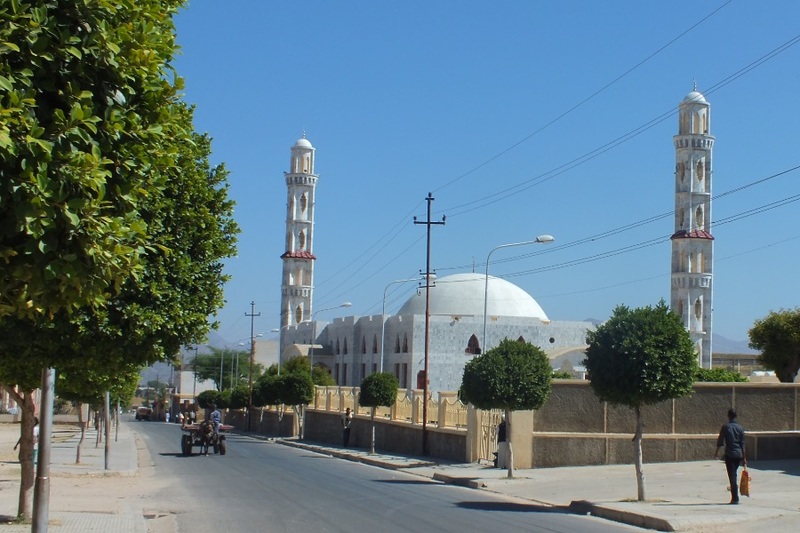 Al Shaba Mosque - Keren Jedit Eritrea. 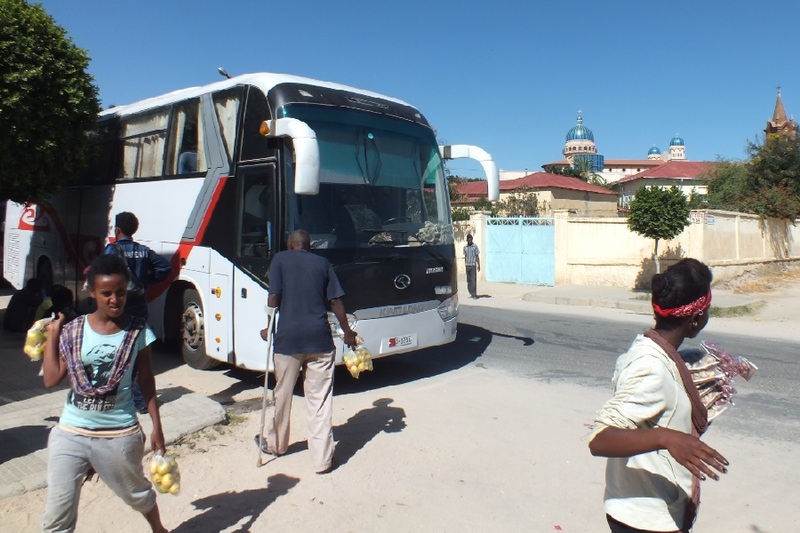 Harat intercity bus - Keren Eritrea.